Whilst not allowed in the region’s numerous national parks due to concerns that domestic pets could threaten the native wildlife, Brisbane dog lovers have a range of options where their pooch can accompany them on bushwalks or hikes without having to drive for hours to seemingly more dog-friendly areas such as the Gold and Sunshine coasts or even further inland. 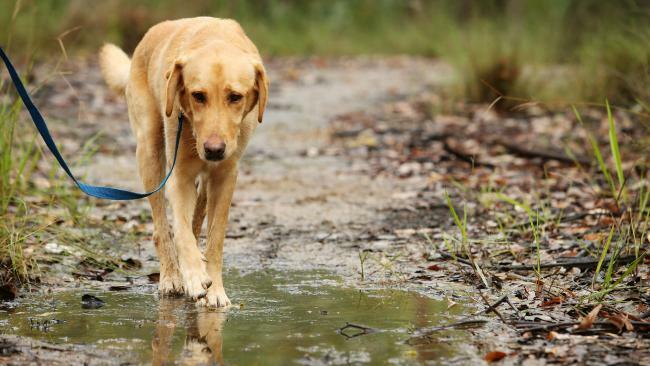 There are a handful of state forests, all within 30 minutes’ drive of Brisbane City, where our four-legged family members are permitted to hike along with their owners on designated trails, as long as they are kept on a lead. Similarly, there are numerous Brisbane City Council-owned parks, wetlands, waterways and bushlands where dogs are allowed, unless a sign is posted at the front of the park stating otherwise. Park somewhere below the William Jolly Bridge and take your dog on the Brisbane City South Bank loop. 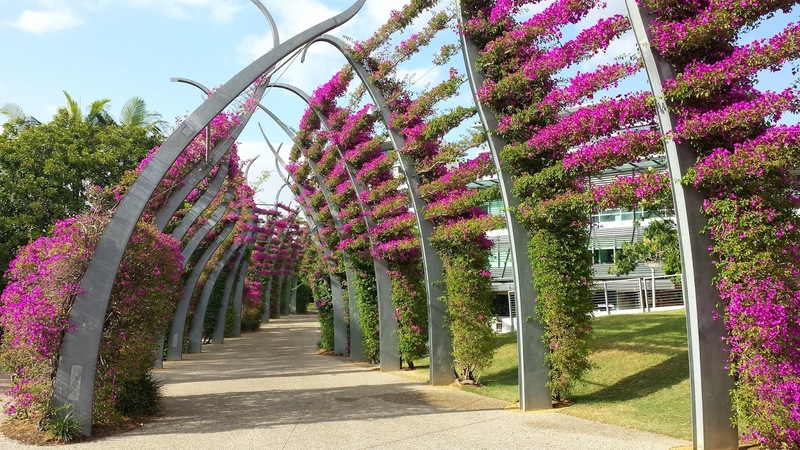 This lovely riverside stroll has plenty of shade trees and runs along the southside of the Brisbane River below the Gallery of Modern Art, Queensland Art Gallery, under Victoria Bridge and on through South Bank Parklands. There are multiple temptations in this area, from cafes to the week-end markets. Follow the bougainvillea arch out at Siddon St, around the Maritime Museum and across the Goodwill Bridge into the campus of Queensland University of Technology. Turn left and walk the cycleway underneath the freeway. Keep your dog close because cyclists also travel along this path. After passing the historic Commissariat stores building, walk up to a crossing on the Victoria Bridge or stroll down George St and then take the Kurilpa pedestrian bridge back over to the GoMA area. For a longer walk, explore the City Botanic Gardens after crossing the Goodwill Bridge before resuming the loop. Another good, shady area through pleasant bushland, 10km south of Brisbane CBD. 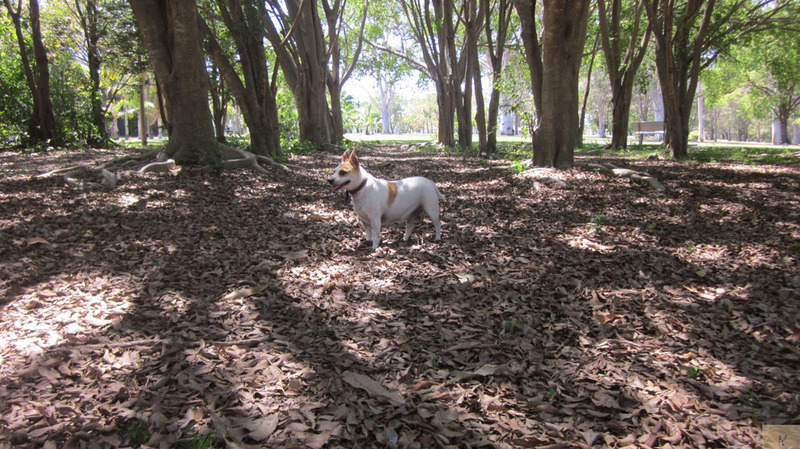 The Toohey Forest Park has an extensive network of tracks ideal for jogging or dog-walking but, as with several other Brisbane City Council reserves, they are home to native wildlife including wallabies, so it is important to keep your pooch on its leash. The tracks hook up with the bushland grounds of Griffith University. Download a track map from www.brisbane.qld. gov.au or call (07) 3403 8888 for brochures on Brisbane's forest walks. Access is from Toohey Rd, Tarragindi, or Outlook Drive at Mount Gravatt. This slice of peacefulness overlooks the Brisbane River opposite the Lone Pine koala sanctuary. The 15-ha park offers no less than two lakes, rambling hills, sweeping meadows, playgrounds, boardwalks and bridges. Your dog will have plenty to sniff around the lakes and along the avenue of Queensland Kauri pine trees - each planted in 1925 and representing a fallen soldier from the area. You can stop for a rest on the riverside path at former lord mayor Jim Soorley's "Sorry Seat". The Sherwood Arboretum has 1100 shade trees representing 300 species, including a mightily impressive Indian bayur tree. Colmslie Recreation Reserve is on the South bank, off Lytton Road in Morningside. Lucky canines can have a play in the spacious off-leash dog park and are permitted to swim in the river - although the fenced dog park is away from the water. Dogs big and small will enjoy running and playing in the park which comes with agility equipment. This doggy destination is fun for the entire family with a children's playground, picnic shelters, barbecues, a boat ramp and jetty. This unique sea walk at Wellington Point is a great tip-off from Ang and Leah at Houndog Day Care, who take many of their regular dog walking clients there regularly. Sea-loving dogs can take the low-tide on-leash walk from Wellington Point out to the tiny mangrove covered King Island. The 2km return walk is suitable for all ages and is a popular haunt of dog walkers during weekdays when dogs are allowed. Alternatively at high tide your dog can enjoy a swim at the steps. Victoria Point is a suburb located approximately 33 km south-east of Brisbane. The park at Victoria Point is a good place to start a loop walk around this quiet bayside suburb. From the Point, walk down to the Air Sea Rescue base and at the end of White St, join the track along the shoreline around to Point Halloran. Walk south (with wetlands on your right) down Point O'Halloran Rd, then turn right up Orana St to the car park of the Eprapah Conservation Reserve. Explore the tracks or turn left past a lagoon on the alignment for School Rd, which eventually turns into a real suburban road. Walk down to Colburn Ave, turn left again and walk back to the Point. Out of the half dozen trails available for your dogs to walk on-leash in the Karawatha Forest, the coolest and most scenic are on the southern side in the vicinity of some remnant ethereal lagoons. Both commence at the lush green Illaweena Picnic area. 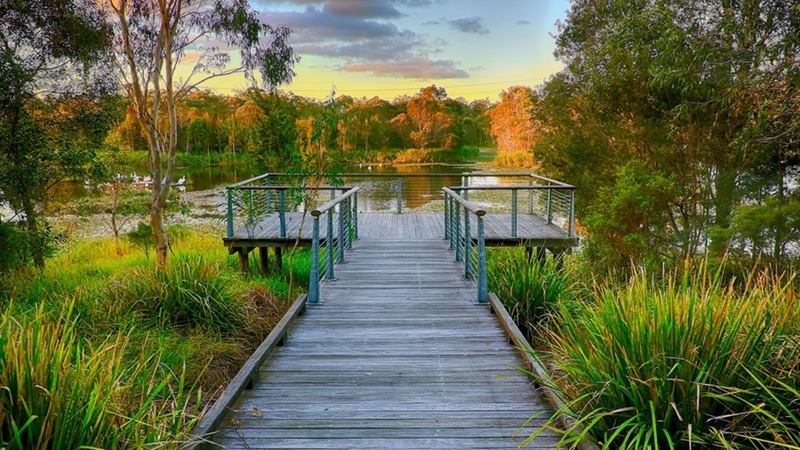 * Melaleuca Circuit – This easy trail starts at one end of the bridge at the picnic area and quickly propels the walker through melaleuca and scribbly gum groves and includes a brief jaunt along a boardwalk raised above a lagoon, only to be back at the start about 20 mins later. * Wild May Trail and attached Lagoon Trail – At a little over an hour, this is the longest of the two water walks. Thee paths can be narrow and semi-overgrown especially alongside the lagoons, so bring closed walking shoes. Entrance: Illaweena St, Streetton or Acacia Road, Karawatha. 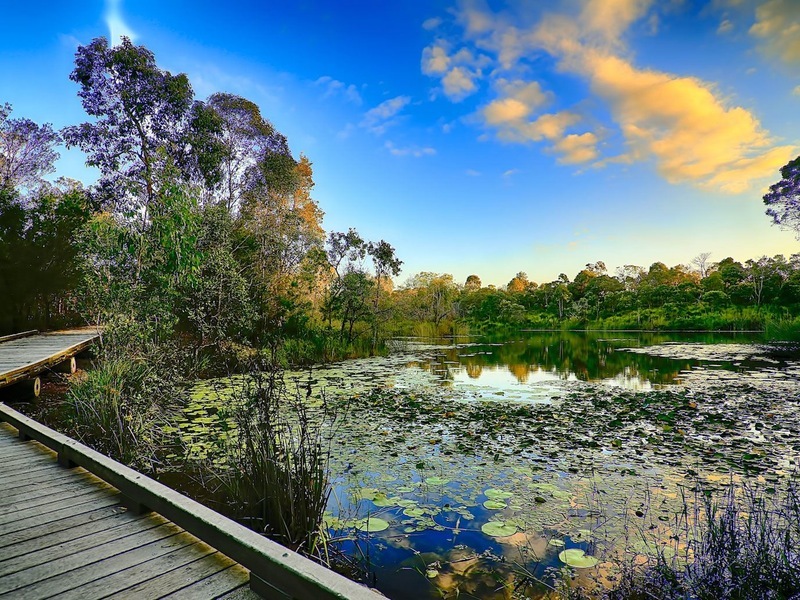 Berrinba Wetlands are a hidden gem to the south of Brisbane, only a few kilometres away from Logan Central. The wetlands are in fact man made and the location was a sand mine prior to World War One. Out of the 120 ha site, eighty acres have been reserved for public use with recreation facilities. 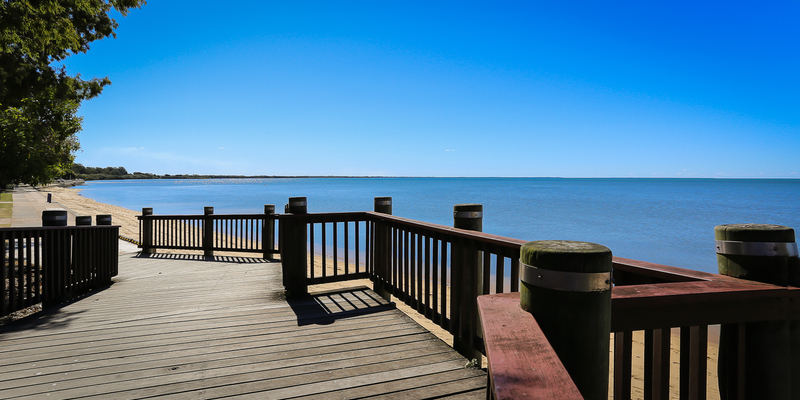 The eighty acres is a nature lover's paradise with eight kilometres of walking tracks and boardwalks and four 80m span bridges.The area is dog-friendly (as long as they remain on leash) and you will find water stations dotted around the place. 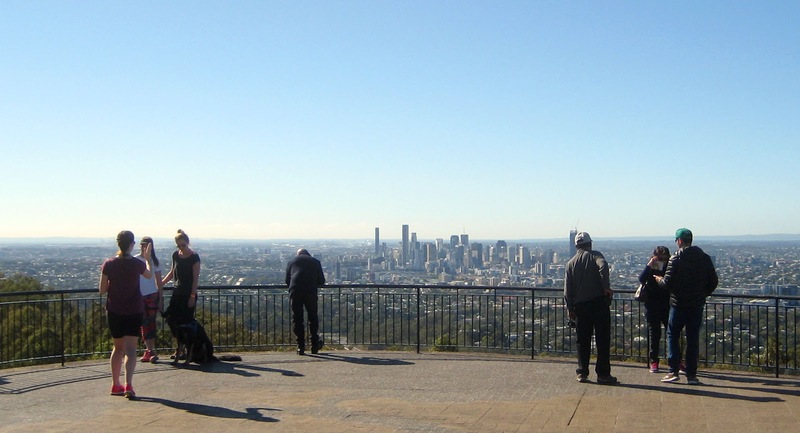 Just 10 minutes drive from the city, the winding walk through native bushland to the summit of Mount Coot-tha is a perfect way to exercise your pet and enjoy one of Brisbane’s most spectacular panoramic views. This beautiful bushy gorge with grassy creek banks for picnics and barbecues offers two interlinked tracks, the Aboriginal Art Trail and the Summit Track. It is very popular with locals and tourists alike and is usually quite busy, especially on week-ends. * Aboriginal Art Trail - A short easy hike of about 20 minutes, via a dirt track that loops through the bush and contains several primitive arrangements of rocks and sticks in lieu of prehistoric cave paintings. The piece de resistance is a jutting timber platform from which to view a cascade of rocks in the dry season and the impressive Slaughter Falls in the wet. * Summit Track - For the more intrepid hiker the Art Trail links to this Summit walk, a steep-at-times 2 km jaunt via scrubby open eucalypt forest to the top of Mt-Coot-tha - where the reward for effort is Brisbane’s most panoramic hilltop view and a refreshment at the kiosk. The return trip to and from JC Slaughter will take about 1 to 1.5 hours. Water stations for your pooch can be found along the trail from the base to the top. Entrance: The Summit Track Walk starts at the far end of the JC Slaughter Falls picnic area (bottom of the car park). JC Slaughter Falls Rd is off Sir Samuel Griffiths Drive. 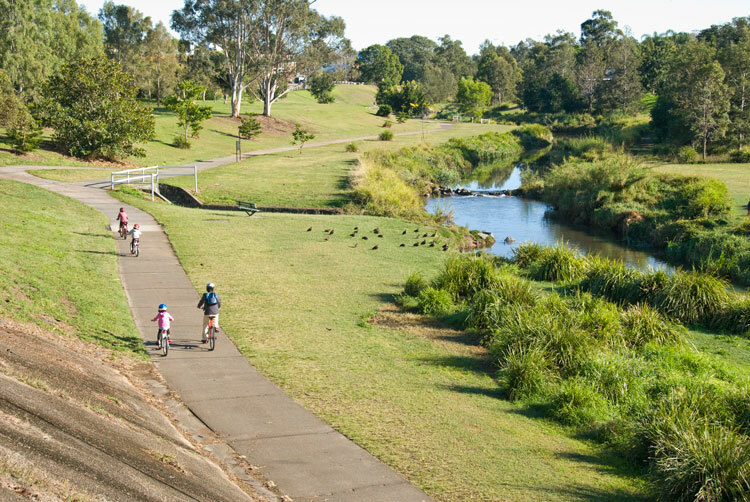 Bunyaville Regional Park is 15 km north-west of central Brisbane between the suburbs of Albany Creek and Everton Hills. Visitors can enjoy bushwalking, horseriding and cycling and this park is the perfect spot for a picnic or barbecue under the forest canopy. Your dogs are allowed on the shared trails only, provided they are kept on a leash at all times. Dogs and horses are not permitted on designated walking tracks or mountain bike trails in the interests of visitor safety. Entrance is via Old Northern Road, Bunya. A string of pleasant parks between Brookside and Toombul Shopping centres offer great opportunities to take your dog for a good walk. 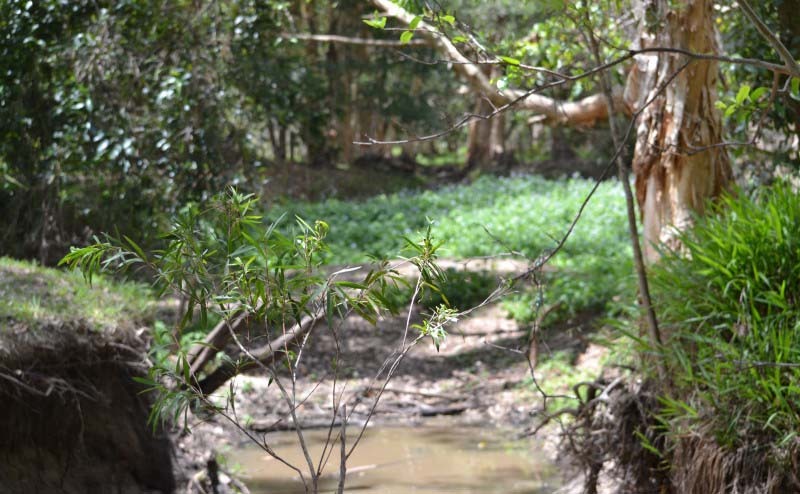 Families love Kalinga Park at Wooloowin and for shade, try the woodland that used to be a US wartime base at the Grange Forest Park in Stafford, which includes a leash-free dog run. There are great amenities for a family picnic in Grinstead Park (Alderley) with walks up past the Sparkes Hill flying fox colony - there is a good track that runs along the boundary of Everton Park High School. According to the locals, this has to be the most carefree dog off-leash area in Brisbane - a wide unfenced green tract of land that follows Kedron Brook for several kilometres from Gordon Park to Lutwyche Road. 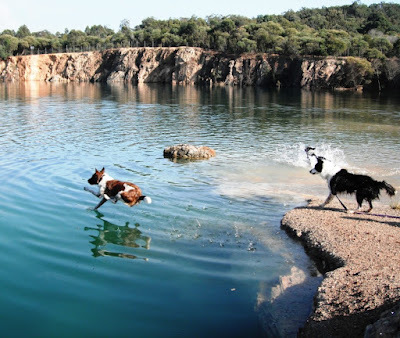 Dogs can romp carefree and dive in to the creek (when it is flowing) to cool off. Perhaps the most popular dog walking area along the whole creek system is downstream from the Gilbert Road bridge at Grange. The north side of the creek is a long grassy expanse set aside by the council for leash-free walks. With big sandstone ''stepping stones'' and a pool ideal for dogs to leap in to fetch a tennis ball just below the bridge, this is a social hotspot for pooches and their owners, especially just before sundown. You can walk downstream towards Lutwyche and let your dog meet and greet other pets. On weekdays it is virtually deserted but in the evenings and on Sundays the dog in-crowd descends for social hour around the Montrose St. bridge. (This section begins where Montrose St. crosses the creek, goes under Thistle St. and continues up until almost as far as Lutwyche Rd). Note that except for the picnic shelters and public parks along the upper reaches there is no shelter on the floodway: it is very exposed but relatively breeze-free at the height of summer. Dotted at intervals along the way are doggy bags and water tap/bowls for our canine companions. Downfall Creek Reserve is a huge 4 hectares of unfenced, off leash, doggy heaven. In fact, as it borders a creek on one side and a light industrial area on the other, there’s not much else there at all! 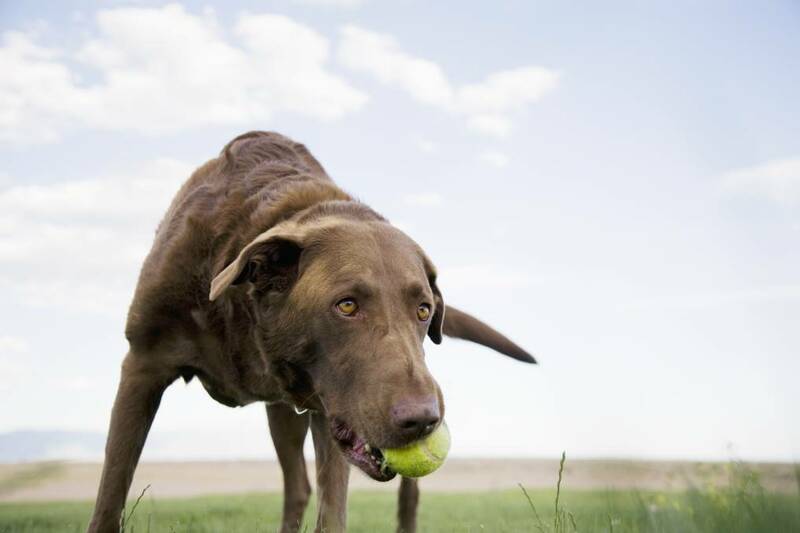 There are lots of open spaces to play and chase a ball as well as plenty of opportunities to catch up with other local dogs. Alternatively you could combine your on-leash walk with a coffee stop and an off leash run. From the café, head to the dead end of Bilsen Rd (about 150m) and take the bridge to the left across to the park. 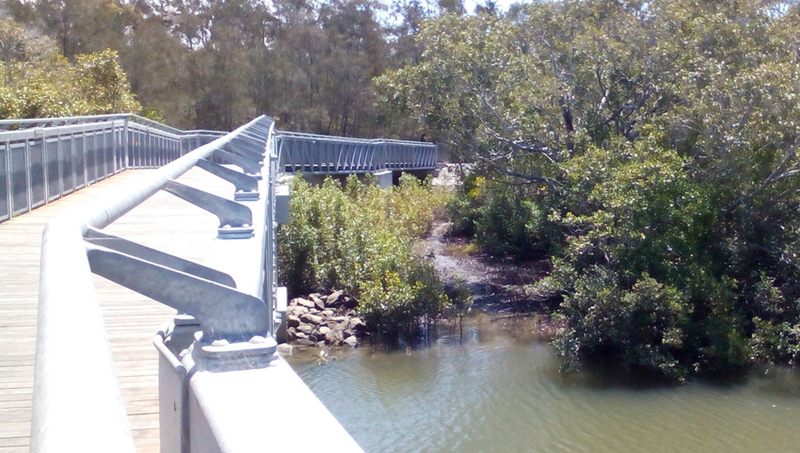 Then head through the park along the creek, cross the bridge at the far end to Jefferis St and from there it is a shady green on leash walk of about 500m following the creek back to Bilsen Rd. Entrance: From adjacent Brickyard Road in Virginia or Jefferis Street or Bilsen Rd in Wavell Heights – from the latter two, cross the bridges to reach the park. 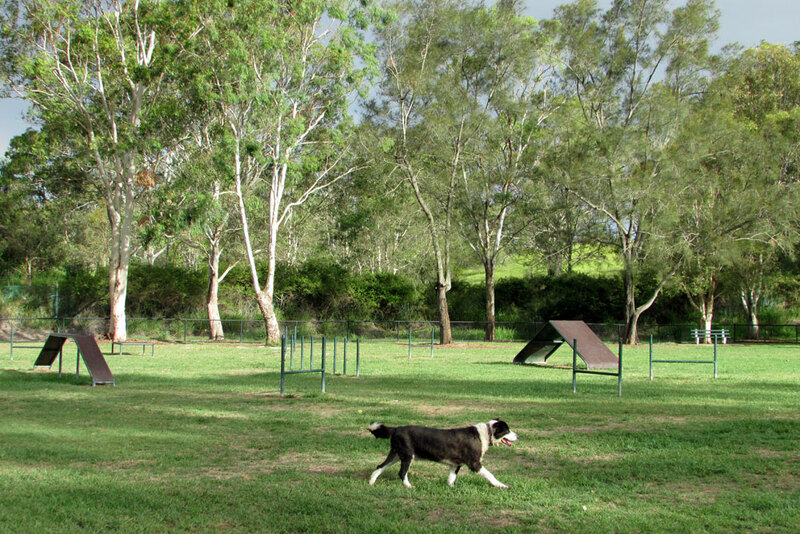 Tuckeroo Park is a 20-minute drive North-East of Brisbane and if you have a dog, it is well worth a visit. The park includes a large, fenced, off-leash area and is home to the “Doggy World” fenced agility course. There is water access for your dog which is just near the fishing pontoon. Note that Kedron Brook can be quite muddy and sandy here, so remember to bring a towel! 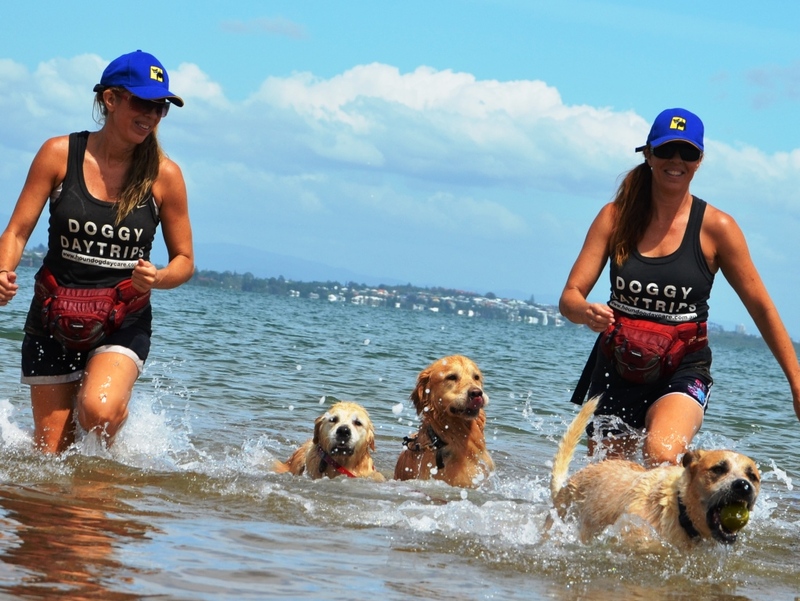 You can also take your dog onto the tidal section of Nudgee Beach, as long as kept on a lead. 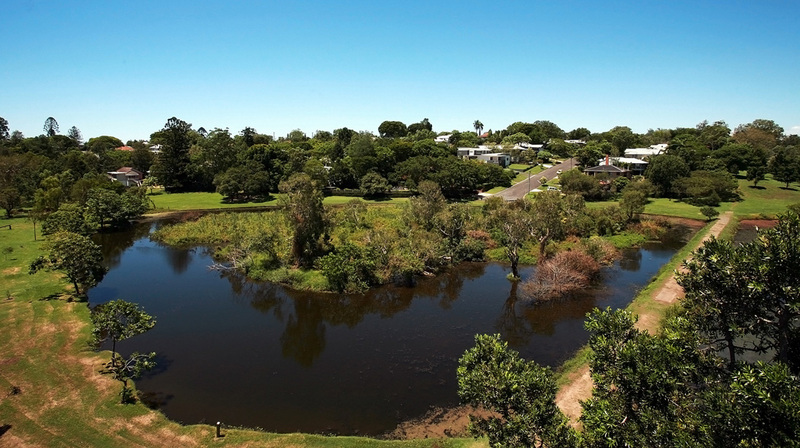 Nudgee Beach is a tiny hamlet of beach shacks and family homes surrounded by wetlands, waterways and beaches, one of which is a dedicated dog swimming area. On weekends dogs big and small descend onto the beach (which fronts the mouth of Kedron Brook waterway) to play water fetch, splash their owners and annoy the local fishermen! Ensure your dogs remain in the designated area and don’t venture into the nearby mangrove bird hides – rangers regularly police this area and will issue on-the-spot fines to the disobedient. Entrance: on your right as you're heading into the township, about 100m past the entrance to the Boondall Wetlands (which is on your left). 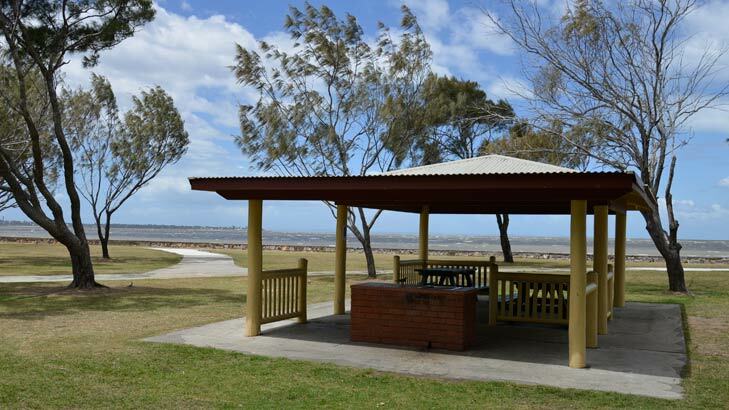 Decker Park is on Flinders Parade in Brighton (19 km north of Brisbane CBD), right on the beach, facing the road bridges to Redcliffe. There is a fenced agility park for dogs, and a playground for human kids, plus your dogs are allowed on the beach and in the water on leash. Deception Bay is approximately 32 km North of Brisbane CBD and its off leash beach is one of the best places to take your dogs for a swim. Firstly, dogs are allowed to romp off leash in the water. Secondly, the bay is quite shallow so whether the tide is in or out, it’s a good place for them to paddle and explore. 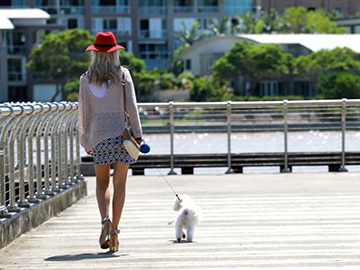 There are a few good areas in Deception Bay where your dog can run free, including the foreshore between Wallin Avenue and Beach Rd and between Seaview Parade and Windlass Street. Another option is on the leash on the foreshore from the boat ramp adjacent to Wallin Avenue to Webster Rd, but only along the walking path. Finally, just up the hill is a spacious playground with barbecues – and even an open storm water channel for fresh water dog wallowing! 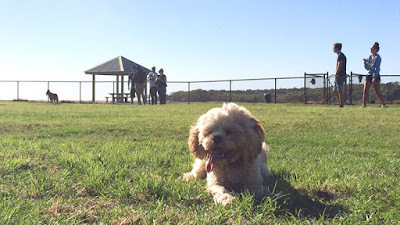 The entire Moreton Bay region appears extremely dog-friendly with a website section dedicated to dog parks and beaches with many suggestions within easy access of Brisbane. Just remember to select a walk appropriate for both your dog's and your own level of fitness. Keep your pooch on a lead in the required areas and have some of those eco-friendly poo bags handy. No one likes dog owners who don't do the right thing and pick up after their pet.